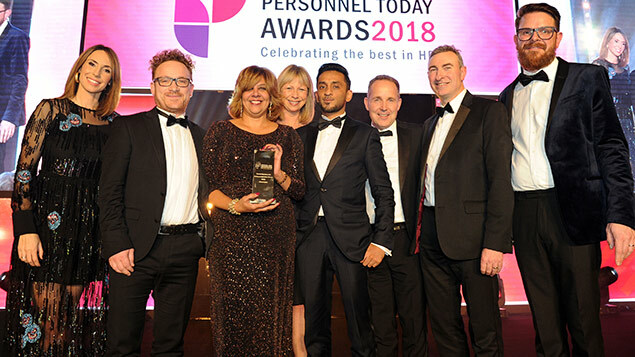 St Mungo's team members pick up their Diversity and Inclusion Award (Public Sector) from the One Show's Alex Jones and Personnel Today editor Rob Moss at the 2018 awards. 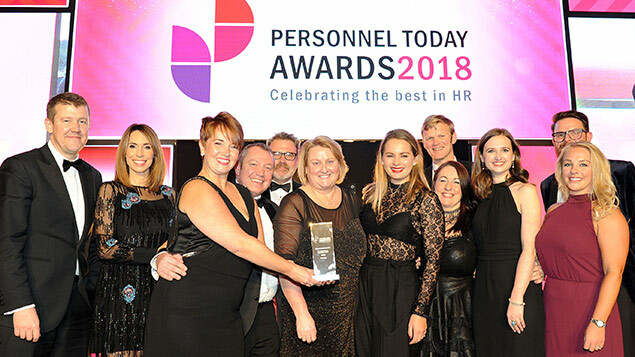 Homelessness charity St Mungo’s commitment to improving diversity in management and its establishment of several networks for employees from minority backgrounds helped it triumph at the 2018 Personnel Today Awards in the Diversity and Inclusion in the Public Sector category, sponsored by The Guardian. Judges also praised a high-quality shortlist with many examples of imaginative outreach, flexible working schemes and strategies for tackling unfairness and improving mental health. The homelessness charity has established inclusiveness as one of its core organisational values and has staff and volunteers from a wide range of backgrounds and identities, with 11% having experience of homelessness. To ensure inclusiveness was at the centre of the charity’s activities seven diversity networks have been established, including a black, Asian and minority ethnic staff network, disability action network and Irish network. These play a full part in the organisation’s decision-making framework. Diversity in management is a key strand of its strategy, and a First Steps into Management scheme was introduced to encourage staff to consider management roles. Managers were specifically asked to support applications by staff from minority ethnic backgrounds and 53% of successful applicants identified as other than white British. St Mungo’s relaunched its internal mentoring scheme and everyone on the First Steps scheme were matched with a mentor. St Mungo’s chief executive and every member of the leadership team have served as mentors over the past two years. Of all the mentees achieving promotion, 69% identified as minority ethnic. The scheme has significantly boosted the number of ethnically diverse staff at senior levels. The charity has formed diverse recruitment panels and has agreed aspirational targets on diversity with the board, which supports this cultural shift. Ethnic minority representation has increased from 19% to 25% across all management roles. Charlotte Sweeney, Charlotte Sweeney Associates. The Civil Service wants to remove any barriers to the success of diverse talent at entry stage and beyond. Its Fast Stream graduate programme is a key pipeline for leadership roles and needs to deliver on making Civil Service leadership reflective of the society it serves. One way to attract and develop diverse talent is through its apprenticeship, internship and graduate programmes. The organisation commissioned research into its attraction channels and how to raise awareness with students. It identified a need for increased on-campus activity; a diversity-focused website; senior level involvement in attraction activities; events such as skills sessions, coaching and diversity networks; and targeted messaging that promotes participants and alumni. The Civil Service targets universities according to student quality, diversity and location, and collaborative partnerships with diversity agencies (including Rare, My Kinda Future and Ambitious about Autism) have been formed. It has made changes to its talent identification processes, such as the removal of verbal and numerical online assessments. Several approaches were introduced to enhance the workplace experience, including enhanced tracking of diversity groups, inclusive leadership workshops to develop skills around engaging and leading diverse groups and improved mentoring and coaching strategies. The results include a 19% black, Asian and ethnic minority success rate at Fast Stream, a doubling of the success rate for lower socio-economic status candidates in 2017 and a 300% improvement for conversion of diversity internships to permanent Fast Stream roles. There were also very positive results from autism internship participants and 50% increase in autism employability rates. The south London and Surrey local authority needed to tackle the problems of mental ill-health in the workplace, a major cause of extra costs, absenteeism, low self-esteem and problems in service delivery. Consequently it has striven to create an inclusive environment to support people with mental health issues and reduce stigma among employees. The aim is to help staff remain in work or return to work from illness sooner. Its Mental Heath and Wellbeing group exists to address mental health issues in line with the council’s values. There are a number of network groups covering areas such as disabilities, LGBT, Women, BAME and carers as part of the council’s “culture board”, chaired by its chief executive. This network has contributed to a review of the council’s appraisal system and policies affecting staff wellbeing and work/life balance. It organises events, workshops, health assessments and support groups including the wider community and local employers. Network members are encouraged to act as champions for facilitate wellbeing events, with one recent example seeing two colleagues in the offending service taking the initiative to arrange free personalised health assessments and taster therapy treatments to staff at the Turnaround Centre, which offers local young people a drop-in service. Results of the council’s initiatives were that 827 fewer days were lost to sickness absence from stress, depression and anxiety between 2016 and 2017, and staff are now reporting much higher confidence levels and an improved ability to discuss their mental health issues. The Swansea-based agency faces the challenge of providing services to the UK in all its diversity from an area that is not particularly diverse – locally, only 4% of people are from ethnic minority backgrounds. The 5,500 employees are in an area that is among the most deprived in Wales. To help achieve a diverse workforce the agency launched an Employability Skills programme last year. Analysis of a survey involving groups such as Remploy, Crisis and Building Communities Trust showed the need to introduce a training scheme to prepare the future workforce. This saw 93% requesting sessions delivered as individual modules as well as a pre-employment workshop to prepare people for what the DVLA roles are like and support them with interviews and applications. DVLA held an information day for community groups to explore results further and collect views. Employability skills ambassadors were recruited from the workforce with the aim of demystifying factors preventing people from diverse and less well-off socio-economic backgrounds from gaining employment. Within a year, the DVLA has found that various groups are now approaching it requesting its support. The programme is working with schools to boost student aspirations through practice interviews, careers advice and inviting groups to tour the DVLA site. The ambassadors themselves have benefited from higher degrees of satisfaction and engagement with their employer. The DVLA is making great progress in its aim to become the most inclusive department in the Civil Service. The Home Office is looking to widen representation of ethnic minorities at all staff levels. Whitehall functions such as the Ministers’ Private Office have traditionally been seen as the preserve of Civil Service Fast-Streamers, typically from non-minority ethnic backgrounds (although efforts to change this are well under way – see above). The Home Office’s BAME staff support group, The Network, has been central to efforts to raise awareness of roles that too often have been considered out of bounds for people from ethnic minority backgrounds. It has worked with HR to identify and train panel members to take part in the recruitment process and to create two-week secondments to provider “taster” stretch opportunities and allow ethnic minority colleagues to test whether Private Office is right for them. These initiatives have produced ethnically diverse selection panels and an increase in staff from ethnic minority backgrounds applying for and accepting Private Office roles. In some recruitment campaigns, two out of three applicants have been from ethnic minority backgrounds. Positive action statements have actively encouraged applications from BAME staff and Private Office roles have been directly advertised to the 4,000 members of the Network. The diversity of panel members has also played a key part in the turnaround. The ratio of ethnic minority to non-BAME applicants to the Private Office is now 50:50. The Insolvency Service is proud of how it has built an inclusive and positive working environment and aims to listen to all voices within its diverse organisation. This year it decided its network groups could come together to have a stronger collective impact. Following on from discussions with senior leaders, members of the senior management team now sponsor employee networks so they can directly hear the experiences and challenges of employees. A key outcome has been a number of initiatives around mental health, including an eight-week mindfulness course, MIND mental health awareness training for managers and a new intranet page offering support and guidance. These were developed in collaboration with the organisation’s Break the Stigma Network, which aims to stimulate conversations around mental health. The intranet page has attracted more than 500 views since it was launched in January, and 300 managers have attended the mental health awareness programme. The Break the Stigma network has hosted three national meetings, agreeing aims and objectives and how these will be measured. 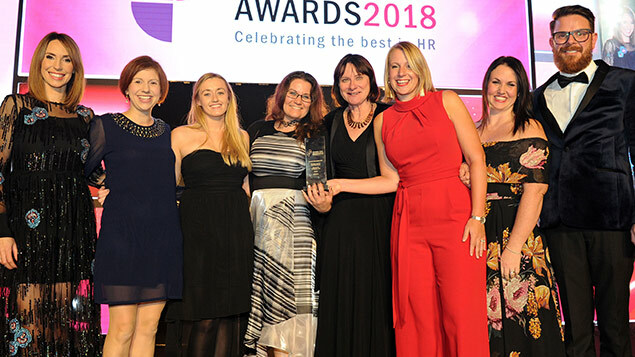 The network won a Gold Award at The Insolvency Service’s Going the Extra Mile (GEM) Awards for its impact on mental health awareness in the organisation. Colleagues and senior leaders are encouraged to talk openly about their mental health issues and coping strategies. To attract high level candidates, the university has sought diverse pools of talent and over the past 15 years has implemented initiatives to attract, retain and support staff from a wide variety of backgrounds. Recently it saw its challenge as being to accelerate change in its workforce profile at every level. The solution was to actively design diversity into HR processes, while engaging managers and recruiters across the university and reducing the effects of unconscious bias. This initiative was titled the Power of Difference and is a person-centred approach using more diverse sourcing channels/tools with global reach, and attracting passive and active candidates. The university has adjusted its recruitment process in areas such as vacancy planning, advertising planning and employer profiles to attract a more diverse pool of candidates. It believes the key to success has been the transformational conversations with recruiting managers to determine the role requirements and discuss gaps in teams using a diversity template. Managers leave the conversation with a fully scoped job opportunity, a clear recruitment plan and documents reflecting the key skills, qualities and strengths needed to attract high quality individuals from diverse backgrounds. The initiatives have been successful: since July 2017, of the 16 posts recruited using this approach, half have been appointed against the characteristics identified. Diverse sourcing channels within one department resulted in three international appointments that applied through the new advertising route. The changes have seen a sharp rise in female candidates for the security team and further initiatives are under way to ensure the team properly reflects the diverse community it serves.